Cradle of Filth are a divisive band if there ever was one; even amongst those who profess to being fans of their work. Indeed, many a heated discussion has been had by this writer debating the relative merits of ‘Vempire Vs Dusk And Her Embrace’, or if ‘Nymphetamine’ holds any merit at all. From their early black metal days, to what some may cite as their commercialisation of the style in the late 1990s and early 2000s, there has been a thematic link of black goddesses and wicked temptresses, cavorting and aborting midst graveyard howls and forest snow. This latest opus ‘The Hammer Of The Witches’ takes its inspiration from the ‘Malleus Maleficarum’, a medieval treatise on the nature and prosecution of witches, except this time, in grand Cradle fashion, the hammer is taken from the prosecutors and turned upon them. On top of this, long serving guitarist Paul Allender, the bands foremost composer for the last few albums has departed, leaving an air of uncertainty upon putting this disc into the player. The traditional instrumental opening, Walpurgis Eve, sets the atmosphere nicely, though a bit more Danny Elfman than usual (also Dani’s make-up this time around is very Jack Skellington), and features violins. The first song proper, ‘Yours Immortally’ puts us on familiar unhallowed ground and straight away the addition of the two new guitarists is evident; leads weave in and around, giving certain sections a distinct NWOBHM feel, not least toward the middle when the drums hit upon that old Maiden-esque galloping rhythm. ‘Enshrined In Crematoria’ and ‘Deflowering The Maiden Head, Displeasuring The Long Title’ continue with much more subtly implemented keyboards than I’ve come to expect recently, and front-wraith Dani Filth, though now in his forties, has certainly retained that distinct ability to hit notes associated with arachnophobia-ravaged toddlers chained to the gates of a spider-farm. Though absent from this opus is the previous albums ever-so-adorable attempts at clean singing. ‘Blackest Magick In Practice’ opens at a slower pace (though that’s not to say actually slow; maybe warp 7 as opposed to the warp 9 of the previous few tracks) but it soon speeds up and contains my favourite solo of the album. Cradle have never had guitar work quite like this before and it makes for quite the exciting listen, as well as giving ‘The Hammer of the Witches’ a unique identity within their discography. The title track marches in pompously before changing halfway to a pungent blizzard of nightmares before first single ‘Right Wing Of The Garden Triptych’ opens with glitchy techno noises reminiscent of their ‘From The Cradle To Enslave’ era and contains yet more awesome lead guitar work. ‘The Vampyre At My Side’ opens with some acoustic guitar (!) before building to one of the more punishing riffs in a career of punishment. This song contains a bit of the danceable ‘black ‘n’ roll’ sound typified by latter-day Satyricon and could become a live favourite. And finally ‘Onward Christian Soldiers’ concludes the album in a catchy manner coming off as a summation of the musical content to be found here; tremolo picked black metal, creative synth use, more splendid lead guitar work, and brings Hammer of the Witches to crescendo before the traditional instrumental outro. 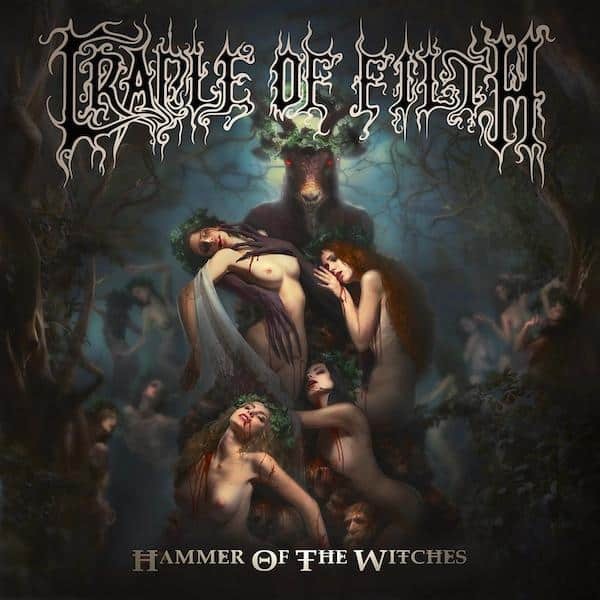 Overall this is perhaps the best album this band has released in a decade or more and though it is still very much Cradle of Filth and unlikely to sway their detractors, those who enjoy this band’s work will surely revel both in its new and nostalgic twists on their firmly established sound. The lyrical content, as always, is complex and scribed with a romantic flair for language, with Mr. Filth imbuing every syllable with ghast and spite. The synths are thankfully implemented to a degree of innovation far more than just as mock orchestration and the stand-out guitar work brings a welcome sprinkling of good old fashioned heavy metal to proceedings. The injection of fresh blood into the band seems to have brought a new energy and creative potency that I for one hope they can continue to harness. Glenn is a York based light and fluffy Puddin'.